Psychologically devastating death metal, like walking in from the winter snow, into an abattoir, floor slick with the unidentifiable entrails of once-living organisms. ‘An Ode To A Nameless Grave‘, one of the finest song titles in death metal, encapsulates the epic nature of this music, humble in origin, struggling to escape the speed metal that birthed it, a conscious study in the beginnings of ambition in death metal. Mental Funeral saw Autopsy diverging further from the template they shared with Death on the bands’ debut albums. Chris Reifert had already assembled a crack team of the morbid-minded, which came into their own on this album, creating an unremitting and entirely original strain of death metal that has influenced the gruesome, B-themed underbelly of the genre ever since. If ever there was an honorific such as Death Metal MVP, surely Chris Reifert would have an overwhelming claim to it. His contribution to the Autopsy legend is threefold: band creator and chief songwriter, owner of ghastly, homicidal vocals, and perhaps most significantly, the most idiosyncratic and organic of all death metal drummers. There’s no understating that last aspect; Reifert’s drumming style makes the Autopsy sound. Slightly sloppy of execution but always on time, ambidexterous at multiple facets: sliding, rolling bass-drum maneuvers, punkish D-beats including a unique, slow variant, outright doom, and a sense of groove that I can only liken to a twisted take on gypsy harvest dances, Reifert’s drumming is utterly musical and provides the skeleton around which the guitars ply their trade. Danny Coralles and Eric Cutler, the other mainstays in the band, evolve a riffing style which borrows equally from Black Sabbath, grindcore, and musical appropriations from a culture yet to be discovered! There’s nothing like it, not quite pastiche, not sincere homage either; it isn’t without melodic flair, the guitar solos take turns between squirming, atonal rackets, and something moodier and eloquent, and the riffs are of iconic quality. One underrated song in particular, the short ‘Bonesaw‘, hints at more violent, technically intricate developments to follow in death metal. Technicality and progression aren’t charges liable to be thrown at Autopsy; they have made their name on a substrate of foulness, and rightfully so, but to me theirs is an extemporaneous music, an improvised jam, most deserving of the term avant garde, in all the right ways. Asphyx‘s revolving door of personnel changes are confusing, but Eric Daniels on guitar was the constant throughout their seminal run in the ’90s. A style heavily indebted to speed metal technique, Asphyx injected copious quantities of doom and a European – and by association, distinctly un-American – melodic aesthetic into their music. Retrospective and the internet has made it commonplace for bands across the globe to sound any way they wish, but it is hard to imagine this music originating anywhere but Europe back in the early ’90s, such was the cloistered design of the underground then. Like countrymen Pestilence‘s earliest efforts, Asphyx, during their faster sections, have the “bounce” one associates with speed metal bands. Frequently used is a speed metal technique where galloping, low-string chugs are used between roving swarms of power chords, drum beats serving to accent those power chords. This is primarily used to speed up tempos, and therefore is a mechanism of great importance, considering doom is the omnipresent hallmark of this band. 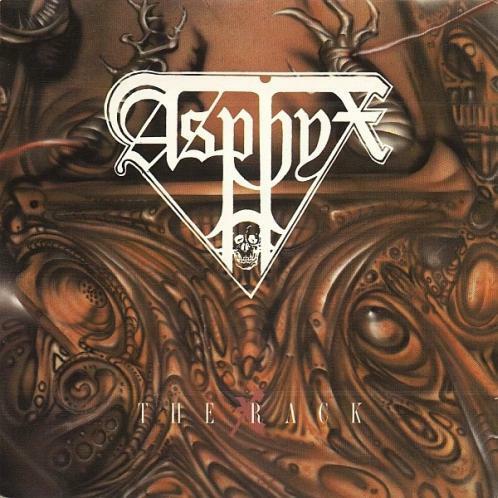 Ironic, then, for Asphyx‘s main achievement to be peculiarly life-affirming. Lethargy, torpor, and the general weight of life oppresses us all, but Asphyx, by juxtaposing that negativity with the effervescence of motion in their music, teach us that the way out is to not lie down prostrated, waiting to be crushed out of existence, but to fight through the mire to gain a better view of where we’ve come from. There are many similarities between Mental Funeral and The Rack, primary among them being the intelligent, alternating use of slow and fast sections. The albums are graced with two of the most distinguished vocalists in death metal. They both carry a refined sense of melody, albeit of a more traditional inclination in the case of Asphyx. Mental Funeral, however, by way of its unpredictability, its irreverence of nascent genre conventions, its progressiveness, and its outright memorability, is the better death metal album of the two. Autopsy go through to Round Two. This entry was posted in Death Metal and tagged asphyx, autopsy, Chris Reifert, Danny Coralles, Death Metal Battle Royale, Eric Cutler, Eric Daniels, Martin Van Drunen, Mental Funeral, The Rack. Bookmark the permalink.